There are many ways to be part of and contribute to the work we do! 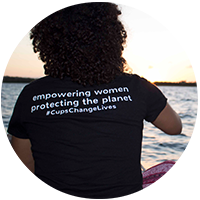 We need help raising the volume about menstrual cups and our work to tackle period poverty… so tell your friends, family, and everyone in your network about The Cup Effect, or invite us to speak at your event! Buy a cup from us – for yourself or for someone else as unique gift! 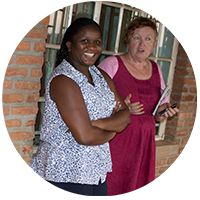 We are a non-for-profit organisation so every cup we sell helps to provide cups and training to TWO people grappling with period poverty in the UK or East Africa. Visit our shop here. 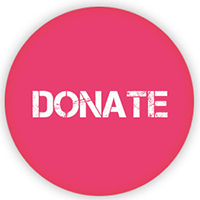 You can support our work by making a donation, which will enable us to reach more women and girls. 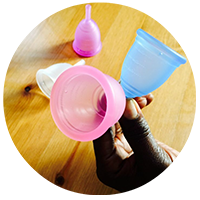 As little as £25 will help to provide one person with a menstrual health education session, access to support from one of our partner organisations, and their own menstrual cup which will last for a whole decade! Make a donation here. If you can volunteer your time and skills in any of the following ways, we’d love to hear from you, we’re looking for: social media whizzkids to help us boost our online presence and profile; marketing experts, PR people, and journalists to help raise our profile; people with links to academic institutions or experience to help us develop and refine our approach to evaluating and demonstrating the impact of our work; photographers or filmmakers looking for a great project to document; and people who can support us at events. Contact us here to let us know how you would like to volunteer your time and expertise at The Cup Effect. © The Cup Effect 2018. Registered Charity United Kingdom (1166618).